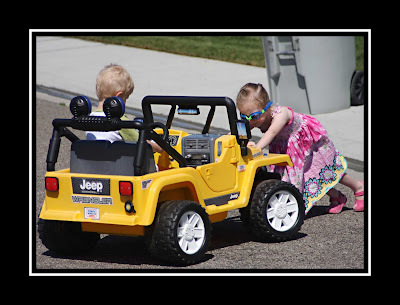 We got this Jeep for Abby and both the kids have loved it. My Neighbor found it at the DI for $15. Clean it up and add a new battery and we are as good as new. It goes a little too fast for my comfort and I was afraid we were going to be paying the neighbors for collateral damage at first with all their crashes, but they have it down pretty well now. Abby can't be too safe with her "protective" eye wear.